It’s a simple sentence: “Bringing hope where it is needed most” but it clearly resonated with people at the launch of the Salvation Army’s Red Shield Appeal Western Sydney. Held at the Parkroyal Parramatta last Friday it attracted a huge number of members of the Hills and Parramatta business community as well as community leaders and politicians. 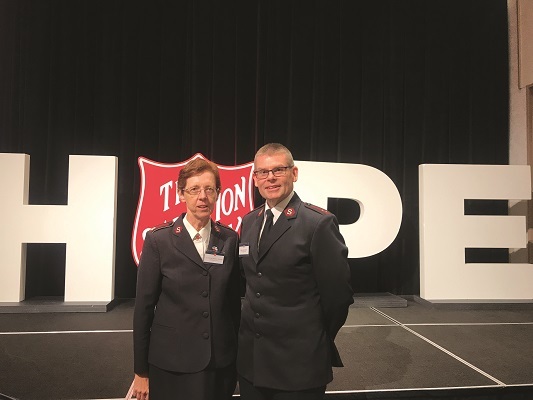 Lt Col Miriam Gluyas, Divisional Commander NSW ACT, The Salvation Army Australia said the Salvos had provided a safety net to 152,000 Australians last year with the help of public donations. After the North Queensland floods the Salvation Army deployed over 70 people, helped 3600 households and delivered over $1.6 million in aid. Western Sydney Appeal Committee Chair, Stephanie Dale spoke about the enormous amount of work the Salvation Army was involved in from rural aid to refugees, homeless people and addictions. “They are the glue that keeps our community together,” she said. Guest speaker was former special forces commando Damien Thomlinson who lost both legs after a bomb blast in Afghanistan. He spoke about the power of team work as his squad spent nearly an hour on the ground battling to save his life. “The best we can be for each other is to reach out your hand to help.” Major Paul Moulds spoke about the range of work that the Salvation Army supported including trauma, isolation, addiction, poverty and abuse. “These are things the Salvation Army encounter every day at their centres.” He said the aim was to create “Communities of Hope”. So far $96,000 has been raised. The aim is to raise $200,000 in Western Sydney by June 1. Money raised by the annual Red Shield Appeal will go towards, family welfare assistance, providing refuge for women and children in crisis, homeless shelters, youth drop-in programs and support programs, emergency and disaster relief, drug and alcohol rehabilitation, disability programs, employment services and training programs and chaplains. The Red Shield Door Knock is the last weekend in May, May 25 and 26 but there is a Workplace Desk Knock and various other fundraisers including a Sydney to Melbourne Bike Ride and a Kokoda Trek.